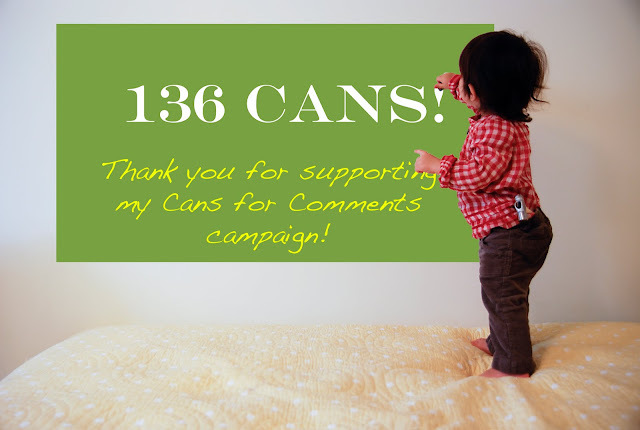 Thank you SO much everyone for the overwhelming response to my Cans for Comments campaign. I'll be donating 136 cans to the Daily Bread Food Bank (almost double last year's donation!). Chloe, HandyMan and I might wait until after the holidays though to make that donation. Though its a special time of year, hunger in our communities is a year-round problem and too often the cupboards go bare once the holiday spirit has faded. I encourage all of you to remember those in need this season and drop off a few cans at your local food bank. You can make a difference! This was such a great idea! I hope you do it each year! Just got back into town and can't believe I missed this. What a wonderful cause. Yay, so happy to hear that you reached 136 cans!! Great work Jen!! That picture is SO cute. And good for you! Thank you for giving.